Back in 1971 and 1972, sitting in my room in Vienna late at night, I would try to tune in Voice of America on my radio to get some news in English. Often, I would, instead, stumble upon a strange news program in English, broadcast by the Albanian international service, and listen with fascination to its upside-down view of the world. At the time, Albania was one of the most isolated countries in the northern hemisphere. It was a closed, xenophobic communist nation that had broken with Moscow, whom it viewed as too moderate in its communistic ideology, and it had aligned with Mao and radical Chinese communism. Its news program was mostly outlandish propaganda, describing a prosperous country beset by enemies whose bad intentions were thwarted by Enver Hoxha, Albania's genius leader. This Stalinist paradise was successfully battling both the pernicious capitalists and the revisionist communists. As I listened to these newscasts, I wondered what it would be like to live such a place. Albania was not too far from Vienna, but seemed to be inhabited by aliens. When I had an opportunity to travel to Albania in 2007 and 2008, I did so with excitement, recalling my impressions of the country from the early 1970s. I wanted to see what this strange country looked like more than fifteen years after it had finally freed itself from the oppressive rule of the Communist party and a megalomaniac leader. The purpose of my trip was to work with the Association of Albanian Municipalities (AAM) to help it develop a strategic plan for its survival in coming years. The AAM had received support from different countries, including the United States, for several years, and it had helped cities improve their ability to provide services, but the country was still quite poor. The AAM needed to develop revenue sources in order to survive when the external funding ended. Fortunately, I knew the leadership of AAM and the mayors of several Albanian cities. I had hosted them at the University of Georgia during a training trip to the U.S. a couple of years earlier. The trip had been useful for them and enjoyable for me, so I happy that I would be able to continue to work with them on this project. The travel to the capital of Albania, Tirana, is easy enough. Several airlines go there from major European cities. I took Austrian Airlines from Vienna, and arrived at a gleaming new airport in Tirana. The exit through passport control and customs was easy. I stayed at a comfortable, reasonably priced (less than $50 per day) hotel in one of the nicest districts of Tirana, a short walk from the AAM offices and downtown. While much of Albania is mountainous, Tirana lies in a valley bordering on steep mountains, a nice setting. It lacks distinctive architecture and has only a few historic buildings. The city is characterized mainly by wide streets and shabby residential high rises that were favored by the communist regimes. Some higher quality new construction has been added to the city in recent years. A good aspect of the city is that the streets in most areas are tree lined and walker friendly. Tirana is Albania's largest city; and it is the trade and political center of the nation. It contains about 600,000 of Albania's 3 million or so residents. It is the obvious place to start a visit to the country, with its museums, government buildings, and cultural life. It offers an good introduction to the exotic blending of cultures that make up Albania. During its history, Albania was a part of the Roman, Byzantine, Bulgarian, and Ottoman Empires, and remnants of these empires are spread throughout the nation. Because of the long rule of the Ottoman Empire, a majority of Albania's population is Muslim, but significant percentages of Albanians are members of the Albanian Orthodox Church and the Roman Catholic Church. Perhaps a legacy of the communist era, a substantial majority of Albanians do not regularly participate in religious services. However, ancient mosques and churches are to be found in most of the prominent Albanian cities. A good portion of Albania is mountainous, and many of the more isolated areas retain traditional mountain culture and life. 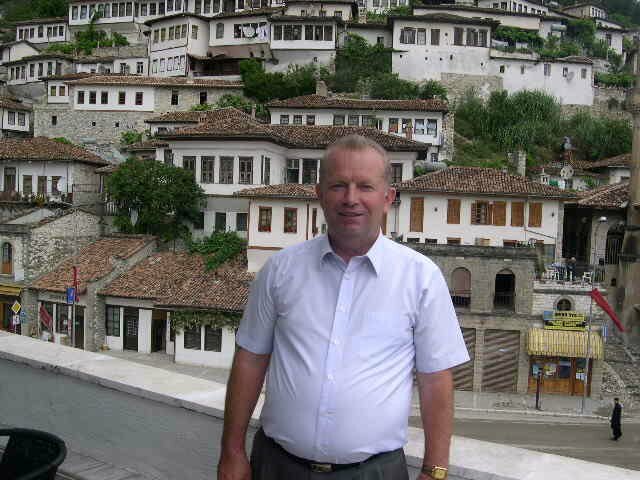 I traveled to Barat, the capital of one of the mountain "counties," whose mayor I knew from his trip to the U.S. (Albania is divided into 12 counties, each with districts, municipalities, cities, and villages.) It is a spectacular city with old houses built into the sloping mountains along the Osum River. Overlooking the city on the top of a high hill is a Byzantine citadel dating back to the 5th century, with a church first built in the 13th century. The history of Barat is a story that starts before the Romans occupied it in 200 B.C. It includes centuries of Byzantine Rule, interrupted by Bulgarian rule, then followed by rule by the Ottoman empire. A visit to this city provides a great history lesson and a humbling view of the sweep of time and how things change. 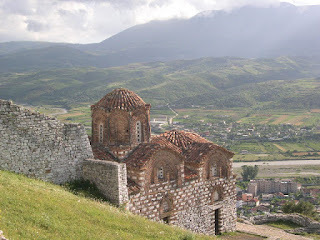 This city is one of the most interesting that I have ever visited, and, alone, is worth a trip to Albania. For those who enjoy the ocean, Albania's long coastline offers places to stay, ranging from isolated villages to developed cities such as Durres, which is located a short (but scary) drive from Tirana. The road is a modern one, recently built and heavily traveled by slightly deranged drivers. 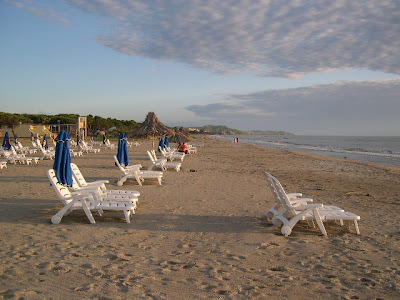 The city of Durres has a huge, unattractive port that seems to contribute vast amounts of pollutants to the Adriatic, but it also contains many large modern sea resorts with sand beaches. I am not sure that I would want to go into the water there for long, but the views and the beaches are first rate and a fraction of the cost for comparable facilities in Italy. 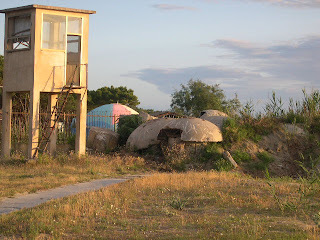 On the drive from Durres to Barat, I noticed one strange feature in the countryside. Along the road, scattered not too far from each other, were hundreds of "pill box" structures. These were heavily reinforced metal structures built into the ground, with openings through which observers and shooters could repel attacks. I was told that there were built by the Hoxha regime in the 60s and 70s to fight off enemies they expected to come by way of the Adriatic sea. Now, they look like giant, isolated, decaying mushrooms. 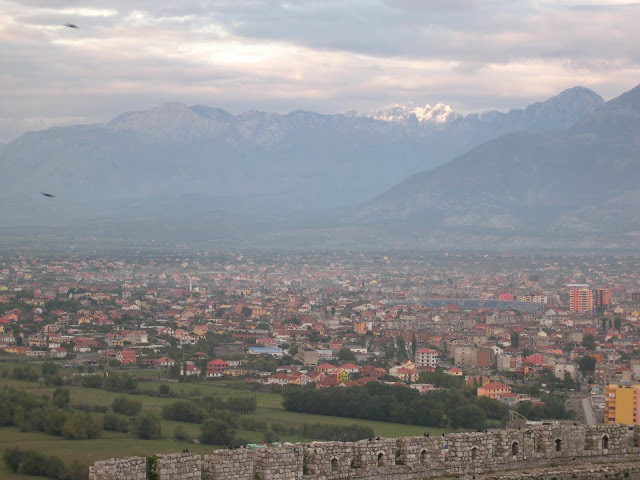 I visited the capital of one other mountainous region in the extreme northwest of Albania. The city's name is Shkoder or Shkodra, with a recorded history as the first capital of an Illyrian tribe in the 3rd century B.C. It was captured by the Romans in 168 B.C. Then was part of different empires for the past 2200 years. The city is located on a large lake (Scutari) and high mountains lie to the northeast and east. It is a short drive from the border with Montenegro. 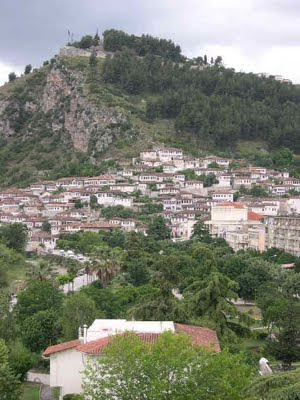 To the southeast of the city, on a high hill overlooking the city, is an ancient fortress. This hill was an Illyrian strong hold, captured by the Romans and held by successive empires occupying this land. It has spectacular views of the city as well as of the confluence of the Buna and Drini Rivers, Lake Scutari, and high mountains. Shkoder has long been a center of learning and culture in Albania, and it has maintained many of its historic buildings, including churches and mosques. 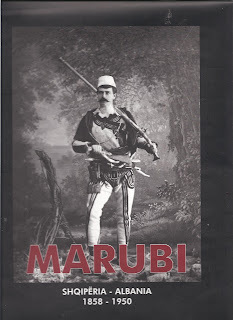 It was also home to a great photographic tradition called Marubi. The name comes from Pjeter Marubi, who began taking pictures in 1858, documenting people and life in the area, and he was followed by others who worked in the studio and took the name "Marubi." The tradition continued until 1950, when the last "Marubi" died. The "Marubi" photographic library, maintained by the Albania government, has hundreds of thousands of negatives dating from 1858 to 1950. The photos provide an amazing views of life and culture in the Shkoder region for also a century. 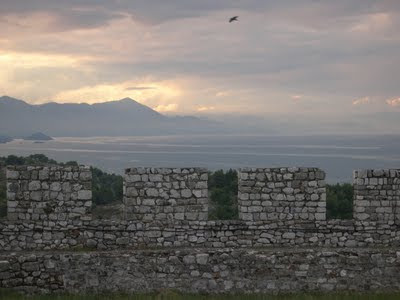 Based on my experience, I can recommend travel to Albania for people interested in a bit of adventure and who enjoy learning new things about human history and under-explored parts of the world. When I return on my own, I will make sure to have three things planned in advance. First, I will find a moderately priced hotel -- these can be found and booked on line. Second, I will have transportation from the airport to the hotel arranged by the hotel or some other service in advance. Third, I will contact a local company to arrange for transportation by car within Albania, and plan to use that service to make day trips to Barat, Shkoder, or other areas that seem of interest. I might also consider scheduling a few days at a sea resort area, but would do some research to find a place where the Adriatic is relatively unpolluted. With such arrangements made in advance, and with flexibility and a sense of adventure, I am sure that any trip Albania will be a memorable one.